Three Chairs Publishing was inspired by a quote from Henry David Thoreau’s Walden: “I had three chairs in my house; one for solitude, two for friendship, three for society.” It speaks to the connections we can make—with ourselves, with our friends or loved ones, with our community—through creative efforts like writing, art making, and photography. Our books include LOOK UP! 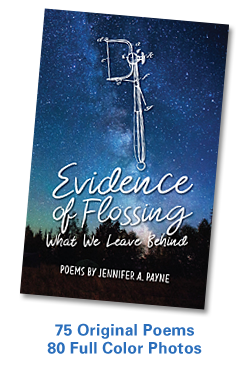 Musings on the Nature of Mindfulness (2014), Evidence of Flossing: What We Leave Behind (2017), and FLOSSING (2019). Three Chairs is owned and operated by Jen. She is a writer, photographer, artist, and the owner of our parent company Words by Jen, a graphic design and marketing company in Branford, Connecticut. Over the years, we have been involved in the creation of a number of independently published books, including: It’s All About Relationships: New Ways to Make Them Healthy and Fulfilling, at Home and at Work by Karen L. Rancourt, Ph.D.; Mind Your Own Body: A Body Image Handbook by Gina Macdonald, MA, LPC, CEDS; three book ins the A Paper-Cut Christmas series by artist Martha Link Walsh; The Civil War Soldiers of Branford, Connecticut by Jane Bouley; Life is Full of Sweet Spots: An Exploration of Joy by Mary O’Connor; Voices from North Guilford, The Stories of North Guilford, Connecticut from The Dudley Foundation; A Treasury of Guilford Places by Joel E. Helander; and Arts & Eats: Recipes from Artists & Friends of the Guilford Art Center. In addition, Jen has served as Vice President, Director of Production and Marketing for Bick Publishing House (Connecticut) for more than 25 years. As such, she has overseen the production of more than two dozen titles including the Independent Book Publishers Award-winner Understand Your Self by Dale Carlson. We’re passionate about books — can you tell? — and we look forward to offering you new books and creative products as the Universe allows. Be sure to follow our Conversations blog, or Like our Facebook page, to join an ongoing discussion about writing, publishing and creative pursuits — as well as information about our current publishing efforts! The Three Chairs logo illustration was designed by lovely and talented Carol Nicklaus.